Most college football fans want their team to be in a big bowl game. The Little Caesar’s Pizza Bowl isn’t a premier postseason bowl game, but it’s the only bowl game held in the Midwest. Finding out that your team is going to this bowl game isn’t the best news for most, and that’s not to knock the bowl game, it’s just not a top bowl game, but these teams were both excited to accept the invite. Western Kentucky, out of the Sun Belt Conference, filled the void left open by the B1G 10 Conference, who didn’t have a bowl-eligible team to submit to the game. This was the Hilltoppers first ever bowl game as they just moved to the FBS after being an Independent team in NCAA Division 1-A. Central Michigan was coming off a 6-6 season in the MAC, and not having been to a bowl game since the 2009 season, you could say it was successful season. 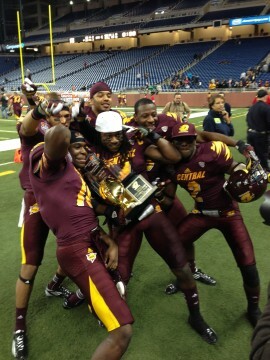 It became even more successful with a 24-21 win over the Hilltoppers for Central Michigan. The Chippewas secured the win after a controversial fourth and two play by the Hilltoppers with 51 seconds left on the clock. In fact, interim coach Lance Guidry wanted to kick the field goal to tie the game, but instead the players convinced him to go for it. The game took on a flow that was a bit sloppy early on, that turned out to get better defensively as the game would go on. The Chippewas got out to an early lead on the first drive on the game. Bowl MVP and CMU senior quarterback Ryan Radcliff found wide receiver Andrew Flory for a 69-yard touchdown reception to open up the scoring. On the first drive for the Hilltoppers, quarterback Kawaun Jakes ran six-yards into the endzone to tie the game. 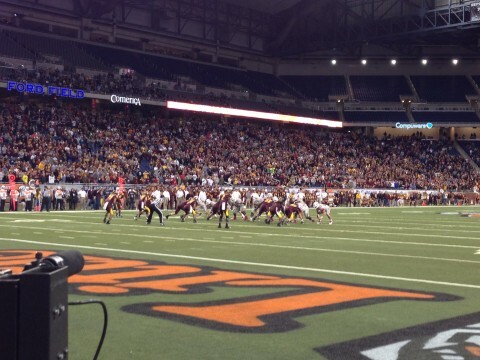 It quickly became a scoring onslaught as the Chippewas found the endzone on their following drive. Radcliff again found Flory for a 29-yard touchdown reception to go up 14-7 in the first quarter. That’s when the scoring onslaught would stop and defense would take over. The next two drives would end punts for both the Hilltoppers and Chippewas. Both teams would go on to break the bowl game punt record, as the Hilltoppers Hendrix Brakefield booted a 74-yard punt pinning the Chips back at their own five-yard line. Chippewas punter Richie Hogan booted an 82-yard punt, which now holds the Little Caesar’s Pizza Bowl punt record. The second quarter started with another Chippewa score, a 50-yard field goal by David Harman, another Little Caesar’s Pizza Bowl record, as the Chips would go up 17-7. The Hilltoppers weren’t going to go away that easily as Jakes found tight end Jack Doyle in the endzone for a six-yard touchdown reception to cut the lead back to three, 17-14. The Chips were looking to go up by six with a 46-yard field goal attempt, but it was blocked by Cam Thomas and the Tops took over, taking out any momentum the Chips has. Another score didn’t happen until late in the third quarter when fullback Kadeem Jones ran one-yard into the endzone for the Hilltoppers to give them their first and only lead of the game, 21-17. It wasn’t looking good for the Chippewas as they couldn’t sustain a drive for the rest of the game until mid-fourth quarter. Radcliff found senior wide receiver Cody Wilson for an 11-yard touchdown reception with about five minutes remaining in the game putting the Chips up 24-21. Central took home the championship trophy, back to Mt. Pleasant with a 7-6 record, their first winning season under third-year coach Dan Enos. Radcliff, after being named bowl MVP threw for 253 yards and three touchdowns. Chippewas linebacker Shamari Benton was named Lineman of the Game, both by media members. It was an unfortunate end for the Hilltoppers first ever bowl appearance, but the fans showed up and rooted their team on until the end. Star running back Antonio Andrews chased the record of most all-purpose yards in the FBS held by former Lions great Barry Sanders, but came up short by just 89-yards. Only 23,000 plus attended the game, considerably less than in past years, presumably because of the crazy winter storm southeast Michigan received, along with no B1G 10 team playing. Both teams ended their seasons 7-6, and will look to improve next year. The Tops hired controversial coach Bobby Petrino in the offseason, but he wasn’t at the bowl game because of the weather.